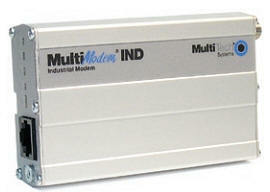 The Multi-Modem® IND industrial modem is designed for rugged industrial and outdoor applications. The metal chassis and industrial-grade components allow for operation over a temperature range of -40° to +85° C and meet the reliability specifications for vibration and shock. With V.92/56K modem speeds, the Multi-Modem IND industrial modem provides the fastest, reliable dial-up rates for modem communication in applications under extreme temperatures and conditions. Applications. The Multi-Modem IND industrial modem provides reliable modem communications in applications where temperatures and other conditions can be extreme. It is ideal for industrial automation applications as well as for outdoor remote equipment monitoring such as weather stations, meters and more. Withstands Extreme Temperatures. A PC modem is typically rated for temperatures of 0° to +50° C. This means that in temperatures outside of this range the modem can start to operate intermittently or fail to operate at all in installations where temperature can not be controlled. The Multi-Modem IND industrial modem is designed with components rated for extreme temperatures ensuring reliable dial-up modem communication in environments operating in temperature ranges from -40° to +85° C. This allows you to provide mission-critical, uninterrupted data communication in any environment without worrying about system downtime. Rugged, Industrial Chassis. The rugged, metal chassis provides complete EMI resistance and transient protection under extreme temperatures and conditions. In addition to withstanding extreme temperatures, it is also tested and approved for meeting reliability specifications for vibration and shock. Increased Upload Speeds. With the V.92 Multi-Modem IND industrial modem, you can achieve an upload speed of 48K bps (30% increase over V.90 modems). This higher upstream speed reduces data transfer time for large e-mails with attachments and for ftp site uploads, as well as improves operation for interactive applications. Global Approvals. With the Multi-Modem IND industrial modem, you need just one modem for worldwide use. This model has approvals in many countries so you can ship one SKU (stock unit) virtually anywhere in the world. Localization kits are available for country-specific power cords, phone cords and telco adapters. Comprehensive Service and Support. The commitment to service means we provide a five-year product warranty and service that includes technical support, 24-hour web site and ftp support. 4.3" w x 2.4" h x 0.94" d; 4.1 oz.